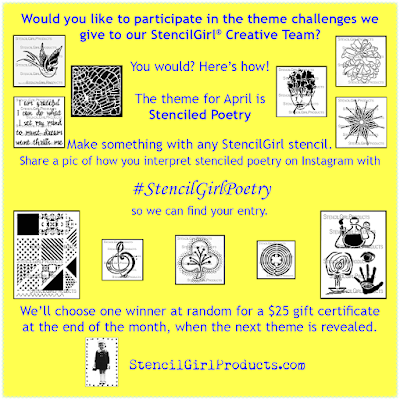 The month of April you'll be seeing posts from our fabulous Creative Team members who were given the theme STENCILED POETRY. I suspect my interpretation is somewhat more literal than theirs will be. 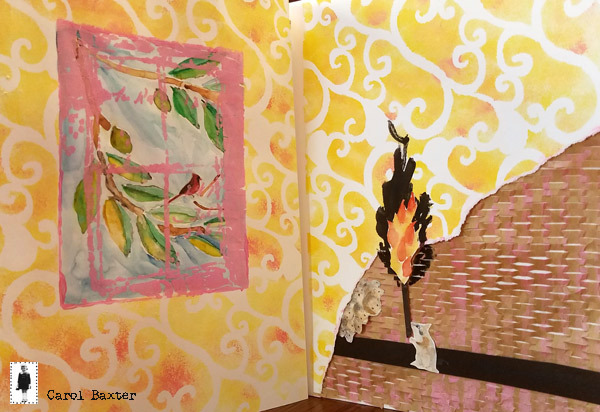 I made a large art journal spread based on a poem that never fails to make me smile, The Country by Billy Collins, one-time United State Poet Laureate. You can find it in the books Nine Horses: Poem or Aimless Love: New and Selected Poems. An immediate diorama popped into my head the moment I read this poem. Simply put, it's about individual logic and a sleepless night caused by a tiny "druid". Moral: cap the matches so a mouse does not light your house up. According to Collins, a poem should "stand on its own" but, being fond of comics, he allowed a few of his poems to be animated for his Ted Talk (The Country starts at the 8:28 point). "When you get a poem on the radio, a billboard, you don't have time to deploy your anti-poetry deflector shields that were instilled in high school," Collins said during his Ted Talk. 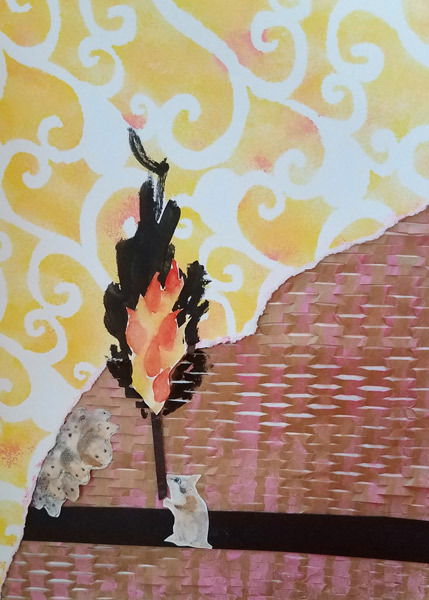 I grew up listening to my Popa read poetry and my art journal spread is in the spirit of sharing my enjoyment of the distillation of words into poetry. 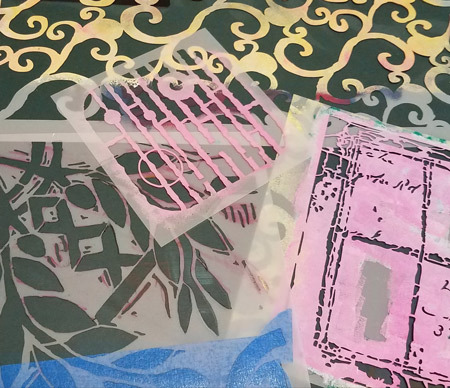 I hope this month of Stenciled Poetry, allows you to look past your deflector shield, slow down, read a poem, and create a new work of art or three. 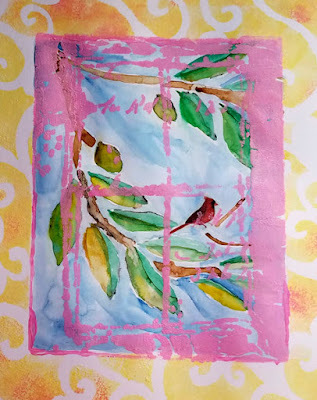 I cut out a piece of paper the size of the window in Window Ledger by Pam Carriker, then aligned that paper with the small stencil from Cuba Libre by Jane LaFazio for StencilClub. 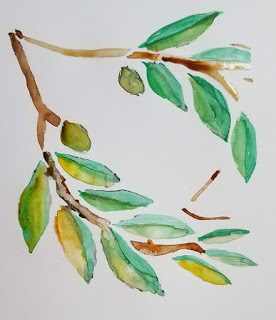 I ignored the "tile" elements of the stencil and painted the leaves with watercolors. 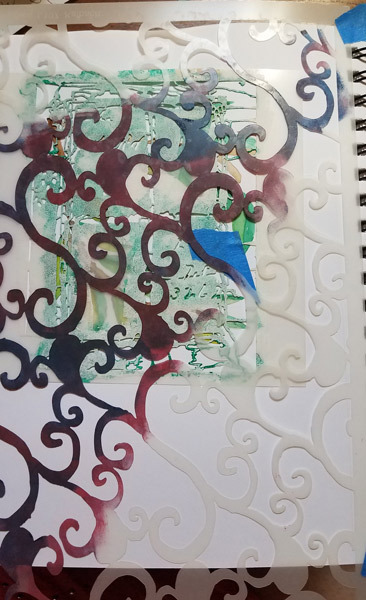 Next, I layered the white paper I had cut over the watercolor, then taped the Window Ledger Stencil down, then over that, the Arabesque by Nathalie Kalbach. I used acrylics to paint the wallpaper and then I carefully removed the Window Ledger Stencil so I could paint right to the edges of the white paper underneath. 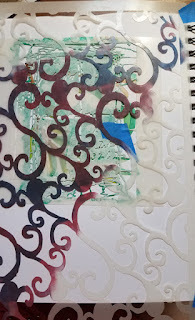 After that, I went back and painted the right side of my journal with Arabesque. 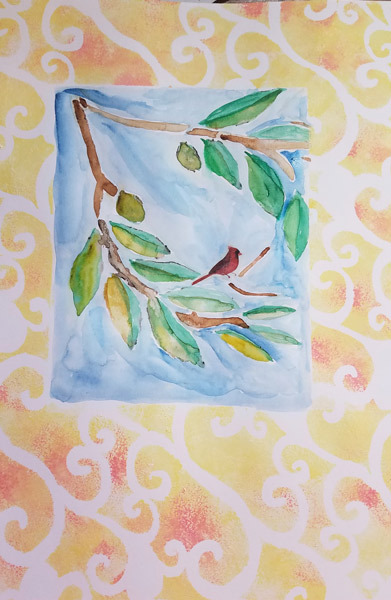 I painted the sky blue with watercolors and added a washi tape cardinal. The mouse side of the wall was made with free mice pics I resized and printed and painted with watercolors. I tore it, glued it plus corrugated paper from my stash to the page underneath. I added a bit of pink with the mini stencil from the Borderlines set Seth Apter designed for StencilClub to the corrugated paper to create "insulation". I painted the flames but the Cascading Feathers Stencil by Jessica Sporn would have come in handy! At that point, I felt like I'd brought the outside into my journal. I finished the left side off with the Window Ledger Stencil. A girly house in the country for sure with my color scheme! It's just a little on the painterly side. Thanks for letting me share. I can't wait to see what the Creative Team does, can you? I love the colors and stencils you used, plus the whimsicality of the image. I love what you did! He is my favorite poet! One of my favorite poems is "Three Blind Mice"! Thank you for sharing! These pieces are lovely Carol - I dig the painterly look! Take care and STAY POSITIVE!